Today we arrived. 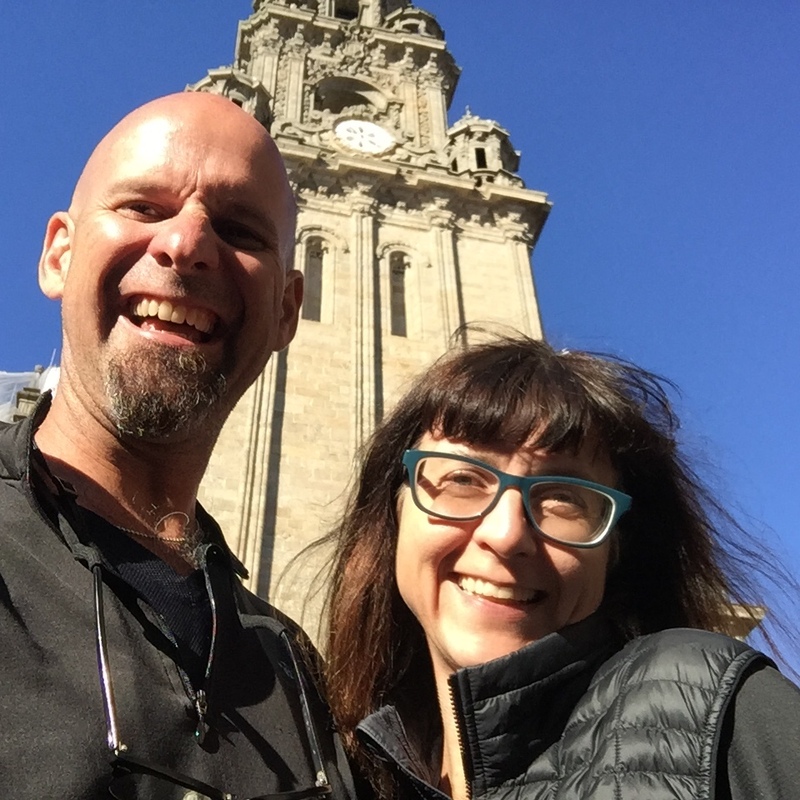 Today we floated into Santiago de Compostela after 14 miles that flew by. We didn’t want it to be over, but we made it by the grace of God. And oh what grace it was. I have never felt as held by God so tightly for so long as through these 369 miles through Spain in the last month. Each day came with a new sunrise, a new beginning, and new blessings. I suppose each day is like that if we choose to see it that way. That is certainly a choice I want to make more often. Today the trail was much like yesterday as we made our way through the farmland on the outskirts of Santiago, and after passing the airport, we were in the suburbs. Just after the airport we saw a couple of familiar faces – Peter and Steven whom we met on our first day on the pilgrimage. It was fitting that we should end our trip with them. As we made our way though suburban Santiago we caught occasional glimpses of the Cathedral. The last mile or so was through the winding streets of the old town. We went through an ancient arch and were standing in front of the cathedral in a large plaza. The grandeur of the cathedral was before us. We made it. We hugged. We cried. We thanked God. Years of planning and months of walking, and the overwhelming grace of God had brought us here. We were no where ready to be done. There was a different sense of completeness that seems to be calling us to something more. It feels energizing and empowering to think of this as a new beginning. As we contemplated what we had done, we wanted to go to church. They would not let us into the Cathedral with our backpacks so we checked into our hotel right next door. The Cathedral is under construction inside and out but is still magnificent – particularly if you like the baroque period. 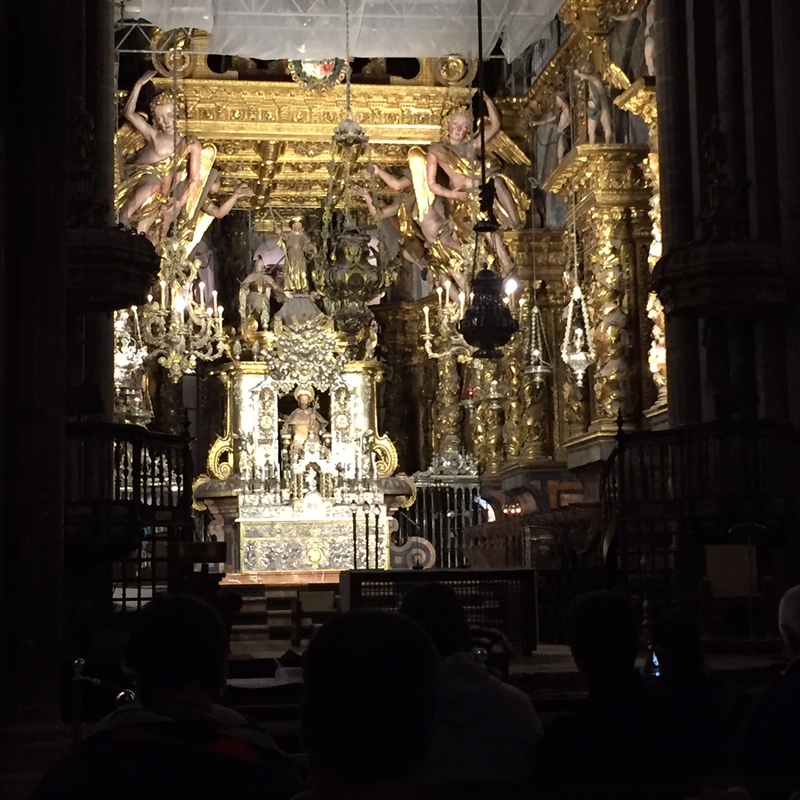 The main altar is surrounded by ornate gold figures and images. 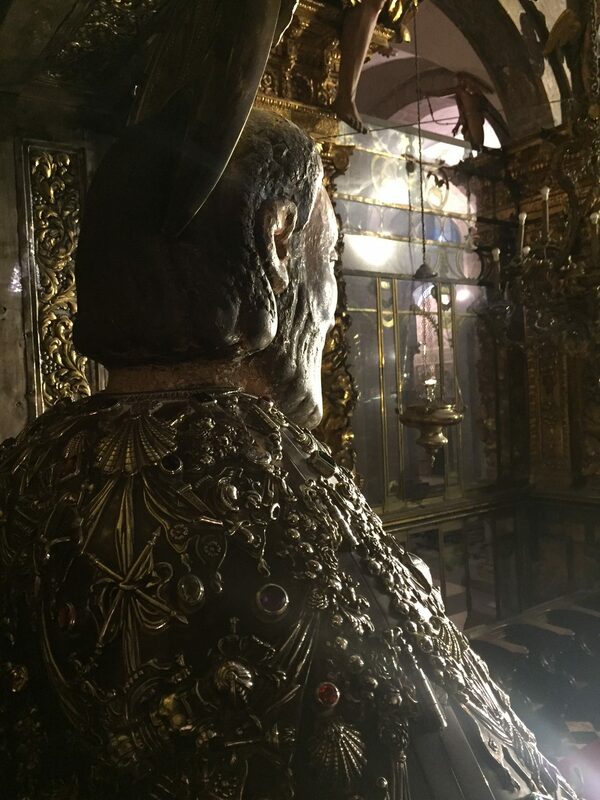 Sitting behind the main altar is the statue of James. The tradition for pilgrims and others is to climb the worn stairs and give the aging apostle a hug. After snuggling his jeweled shoulders we went downstairs to his tomb. A decorated silver box contains his remains and those of two of his disciples. Legend is these three bodies were found in a marked grave in the hills of Spain in 813 and moved to what would become the Cathedral de Santiago and the third holiest pilgrimage site for Christians after Jerusalem and Rome. After lunch and a shower we went back to the Cathedral for one of the daily pilgrims masses where they welcome and pray for those who have made the journey. Our trip is far from over. Having arrived a couple days early, we are shifting from pilgrimage mode to retreat mode. The time to pray has been part of the gift of the last month. We plan to use the neighboring cathedral to pray, contemplate, read and discern what God has in store for us. I feel strengthened by our journey that has ended, opening us up to a new beginning with God.